It has been quite a difficult time for us here in Northern California. Recently there has been a number of horrific fires that have decimated towns and caused terrible air quality conditions across the region. Thankfully the town that I live in did not have a fire issue, but the air quality has made it difficult for everyone. For me, a number of photoshoots that I had scheduled had to be moved due to the air being full of smoke. 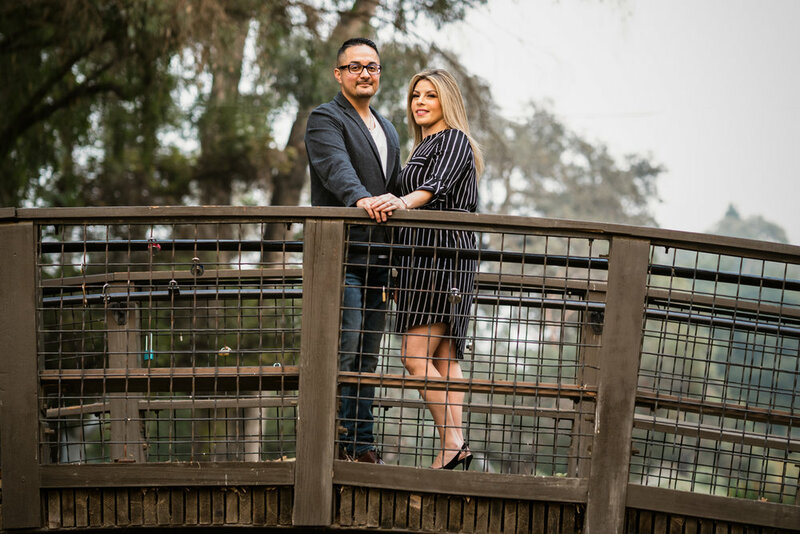 The engagement session that I had for Adrian and Vanessa had already been moved back due to the air quality, but their wedding being just a month away, we had to get the photos done - bad weather or not! We decided to just get out there and shoot for 30 minutes and bang out this session. Our first shoot location was at this bridge. It looks like a cloudy day… but yes… that is the smoke filled air behind them. We headed to a different location that worked a bit better. This area was filled with redwood trees. The smoke is still there, but it doesn’t look too bad in the photos that we took here. 30 minutes is really not enough time to get the amount of photos I usually like to take, but in these conditions it was what we had to be satisfied with. We got in and out of our session in just over half an hour. I was glad to get back indoors and away from the smokey air. I’ll be photographing Adrian and Vanessa’s wedding in a few weeks. I hope our fire situation is finished by then - not just for me, but for everyone affected!